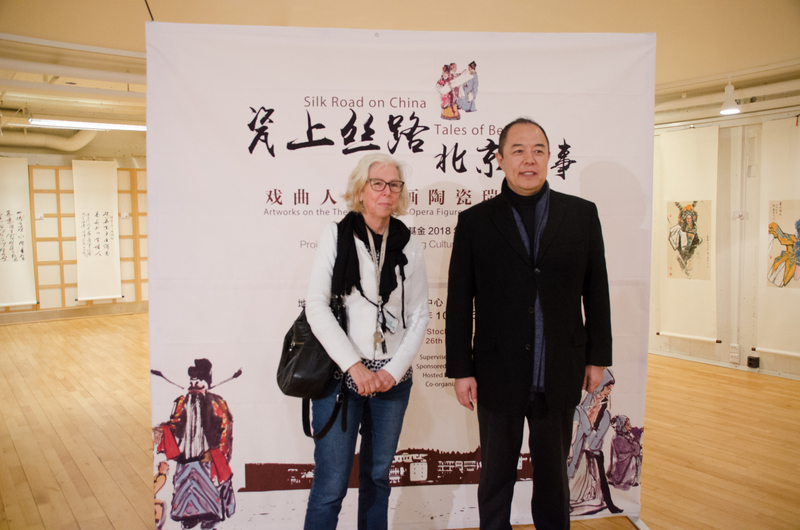 Stockholm, Oct. 29(Greenpost) –In response to President Xi Jinping’s “One Belt, One Road” initiative and to further strengthen international cultural exchange, “ Silk Road on China • Tales of Beijing ” – the Swedish Exhibition of Traditional Chinese Characters and Calligraphy Paintings was exhibited at the Stockholm City Convention Center on the 26th. 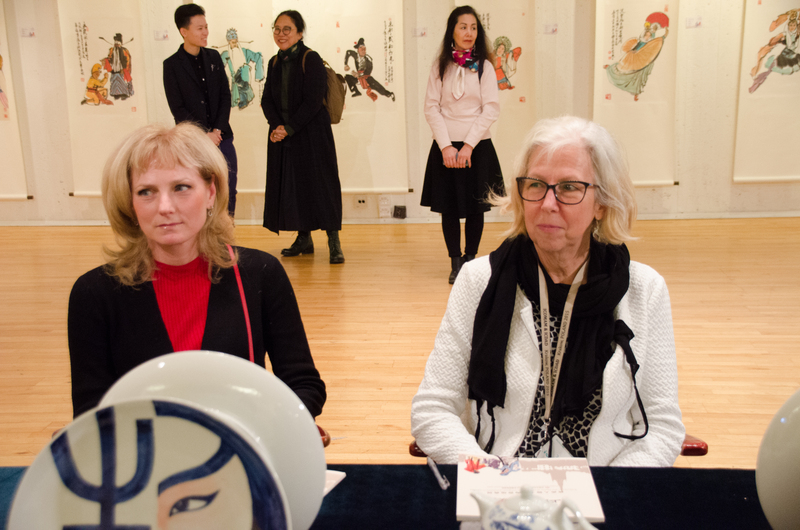 Supported by the Beijing Culture and Art Fund, supervised by the China Culture Media Group, sponsored by the “Art Market” magazine, and the “Art Market” art gallery and art market, the large-scale foreign exchange project was co-organized by Huifeng Painting and Calligraphy Institute. 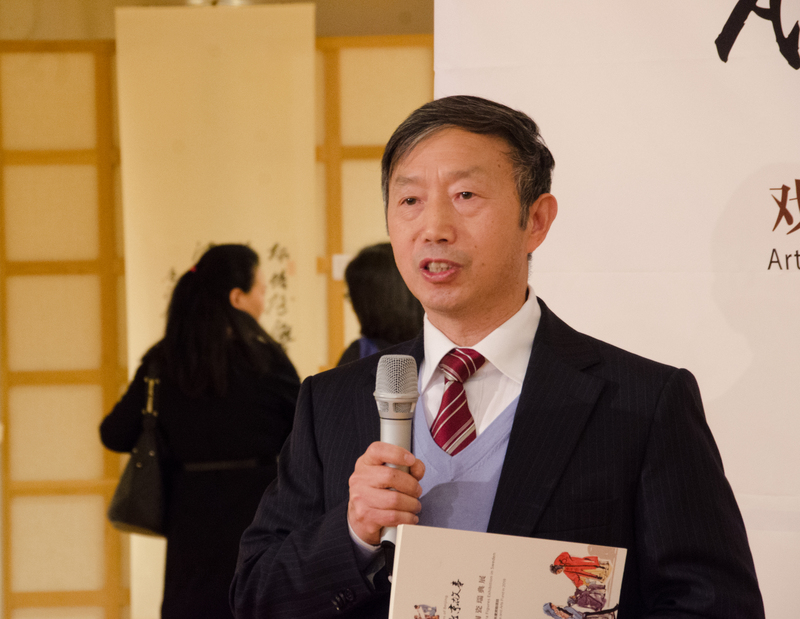 This exhibition featured works of Ma Haifang, a famous old Beijing style painter, Zheng Shanlu, deputy dean of the National Academy of Ethnic Paintings, dean of the Art School of Jinan University, and vice chairman of the International Calligraphers Association, famous actor Professor Zhang Tielin, member of the Chinese Artists Association, Lu Tianning, deputy director of the Capital Museum of Painting, deputy dean of the Art Market Magazine Co., Ltd., director of the Chinese Artists Association, and Cultural Ambassador awarded by China Europe Cultural Association (Sweden) Li Chengxiu and Li Xuewei, a member of the Chinese Calligraphers Association. 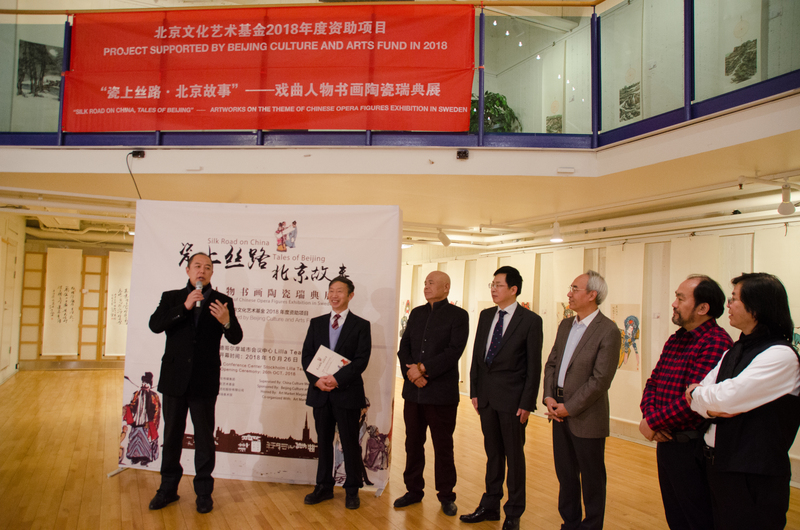 Zheng Shanlu, deputy dean of the National Painting Institute, said at the opening ceremony that the exhibition aims to showcase traditional Chinese art and tell the story of Beijing. With the original art and innovative model as the highlight, the selection of famous Chinese painting and calligraphy artists, ceramic artists and famous opera figures. 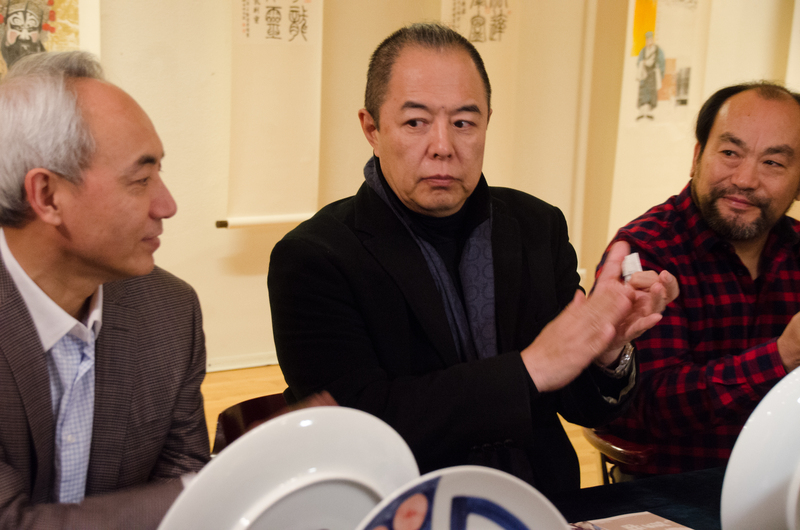 Painters, actors, and Chinese Silk Road research scholars combine Chinese traditional ink art with ceramic art, using exhibits, ink and wash, joint research to explore and explain the most important nodes of the Silk Road in Sweden. “Beijing Story” is the main theme of the painting and calligraphy ceramic arts. 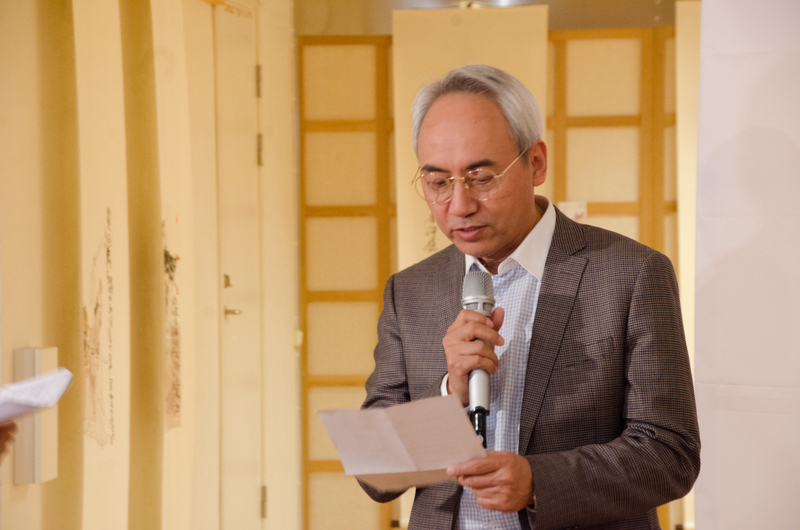 Cultural Counselor of the Chinese Embassy in Sweden, Pu Zhengdong, Director of the Stockholm Chinese Cultural Center attended the opening ceremony and delivered a speech. 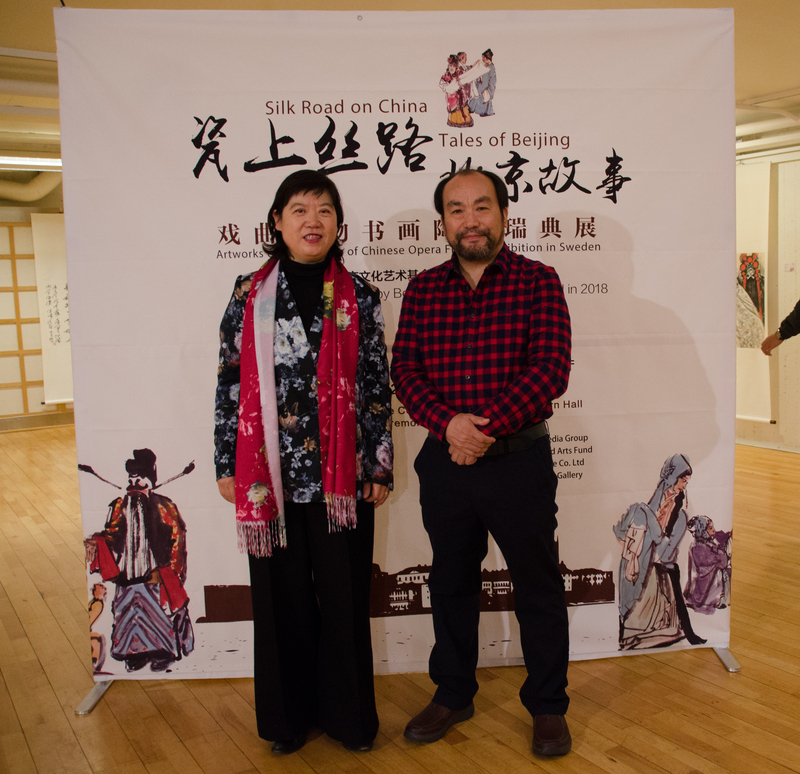 He first conveyed the congratulations of the Chinese Ambassador to Sweden, Mr. Gui Congyou, on this exhibition and wished the exhibition a success. 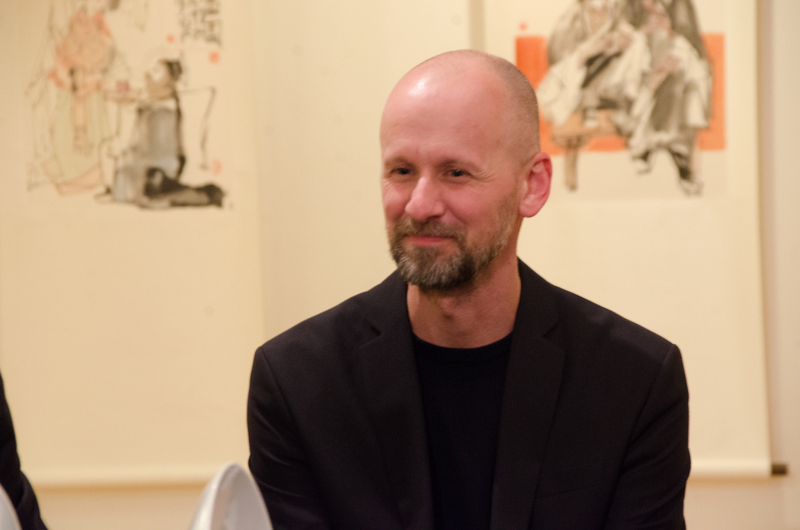 He said that Sino-Swedish cultural exchanges have a long history and current exchanges are also frequent. Not long ago, the delegation of the National Peking Opera Theatre visited and performed in Sweden, which is very popular. Today’s art exhibition is a continuation of Sino-Swedish cultural exchange activities. 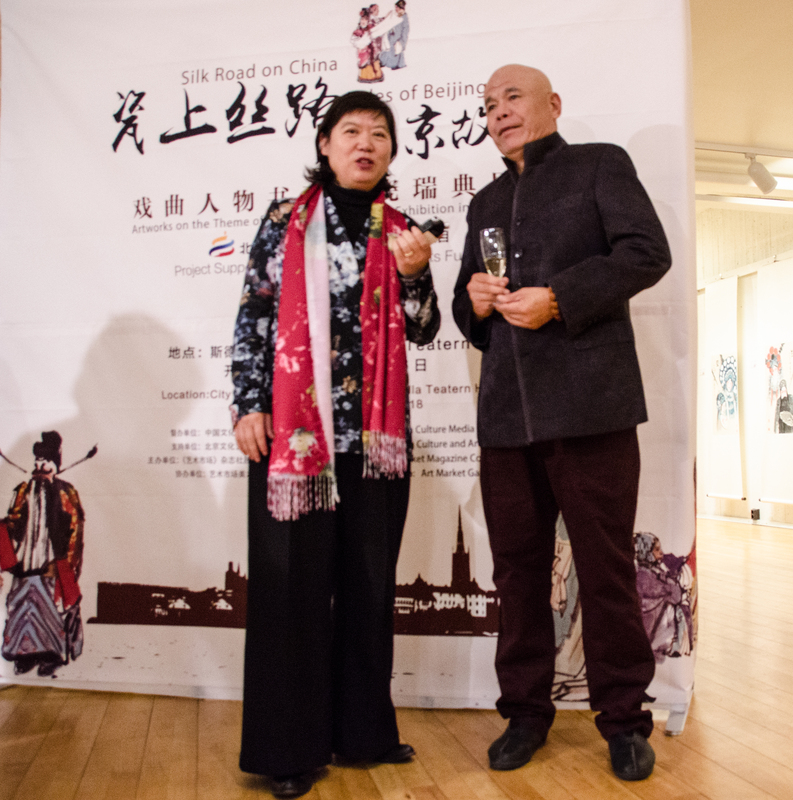 In particular, the delegation also includes Professor Zhang Tielin, a famous actor in China. Since the film “Below the Bridge” in the 1980s, we have been watching his movies and TV series. In this delegation there are professional artists who are also versatile painters and calligraphers. 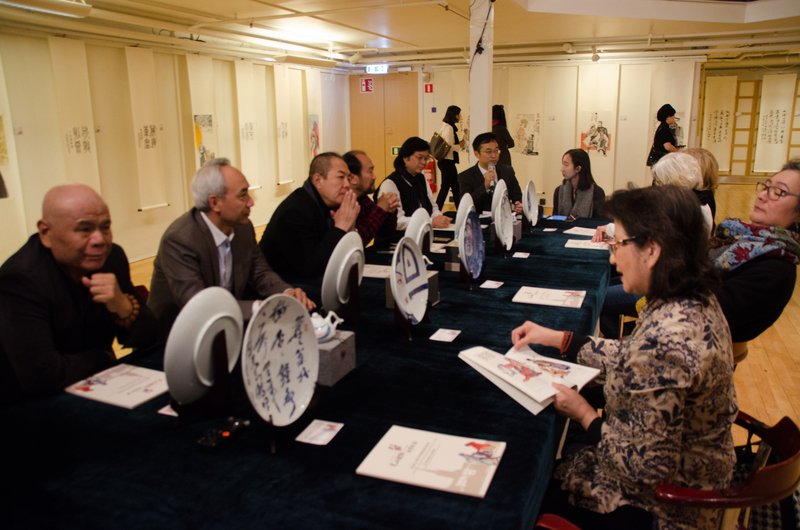 Counselor Pu also invited artists to exhibit their works at China Cultural Center in Stockholm in the future. 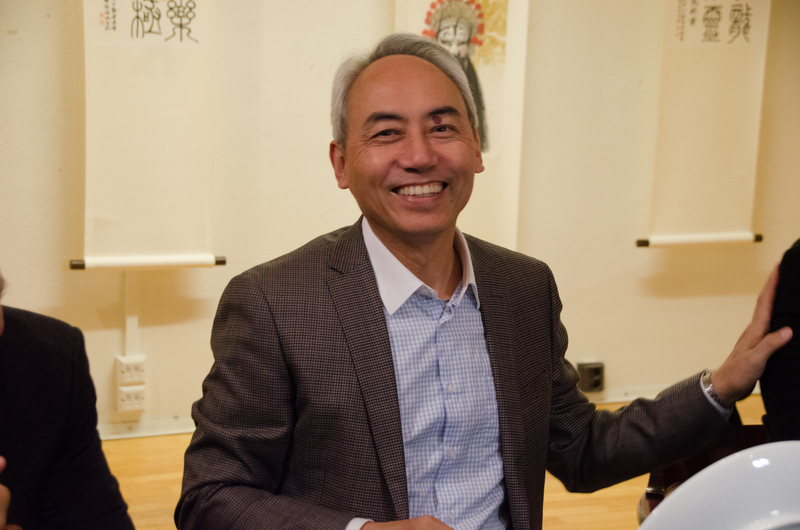 Professor Zhang Tielin said that he had known STOCKHOLM for a long time, but this is his first visit to Sweden. He came with a task and responsibility and felt the mission was glorious. “I am making movies, but I like calligraphy since I was a child. So, I have been here today and I am very proud to be part of this painting and calligraphy group, because these artists are very famous artists in the capital area, so I also feel honoured to be with them. I hope that I will have the opportunity to come to Sweden again in the future and bring out my other specialties.” said Zhang. Eva-Sofi Ernstell, Director of the Swedish Dance Museum also spoke at the opening ceremony. “When I see these Beijing opera figures, I immediately recognized many words in the paintings. I realized this is a Chinese tradition that children can read from the paintings. I think such kind of exhibition should last one month to four month. After communication, I know that they can paint larger ones too. This size was due to the limitation of transportation. We have exchanges with museums. We will be exhibiting silk and ceramics later. These silks came in from Russia, and Russia imported or obtained from China. I think it is amazing that these silks can still be preserved very well. The Silk Road exchange between Sweden and China has never stopped.” said Ernstell. After the opening ceremony, everyone enjoyed the works of the masters. Ma Haifang’s “The Matchmaker”, “No Bone Freehand”, “Five Rats in Tokyo” and “Wu Song Beat the Tiger” are deeply impressed. In an interview with the Green Post reporter, Ma Haifang said: “I am painting Beijing style. This time I mainly painted opera characters. I grew up in the suburbs of Beijing and lived in poor conditions. However, I like to paint. And the opportunity was very good, I was admitted to the Central Academy of Fine Arts, I worked as an art editor for 30 years after graduation, and contacted many outstanding painters across the country. I have always insisted on painting.” said Ma. Ma said that he used wet ink to paint. “I took the color first, then draw the structure. Such a line is different from dry painting. This method is the characteristics of my painting, but it is difficult to grasp. This painting is brightly colored and different from traditional methods. This is also an innovation in painting techniques.” said Ma. Ma said that the main purpose of this visit to Sweden is to exchange. After China’s reform and opening up, it’s hoped to let overseas Chinese and Swedish friends understand the content and characteristics of Chinese culture. Learn about the characteristics of old Beijing and Chinese Peking Opera, treasure of China. Li Chengxiu’s paintings are Dayushajia, or “Asking for Fishing Tax”, “Sanchakou” which shows Chinese Kungfo and “The Beautiful Spring “. 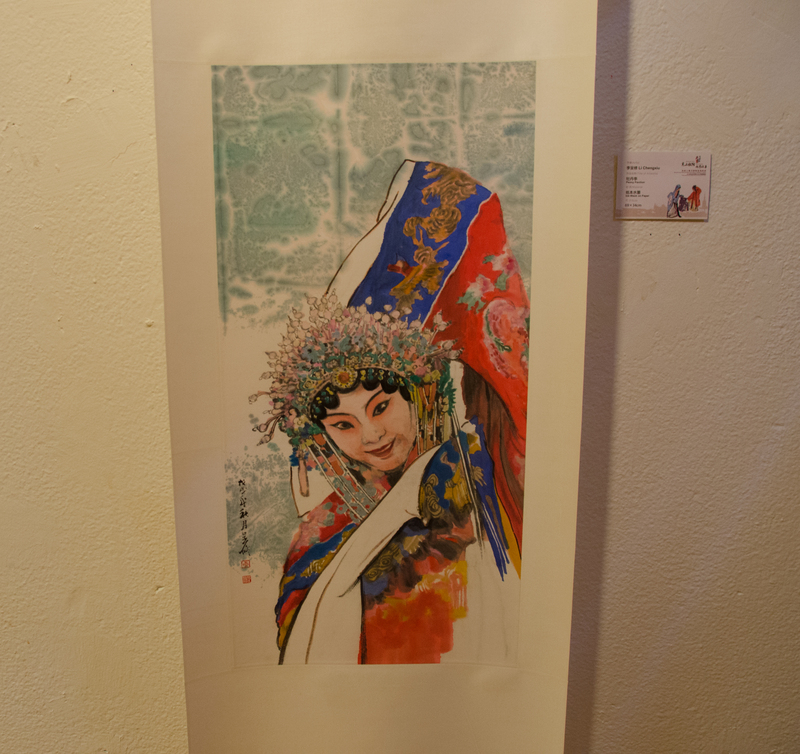 In an interview with reporter, he said that this exhibition is based on the Beijing opera, and draws paintings around Beijing opera characters. The Belt and Road initiative provides a great opportunity for our artists. 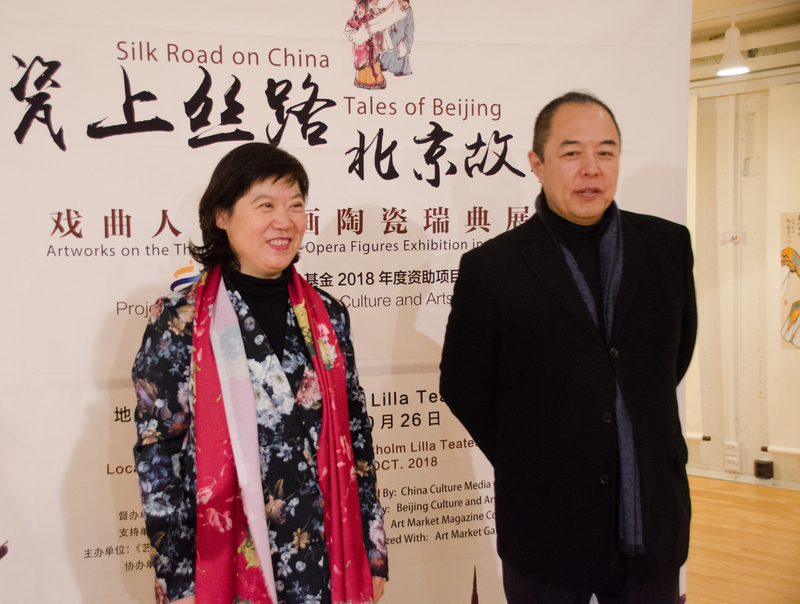 Through the Belt and Road, artists from different countries along the silk road can be connected and exchange ideas and arts. 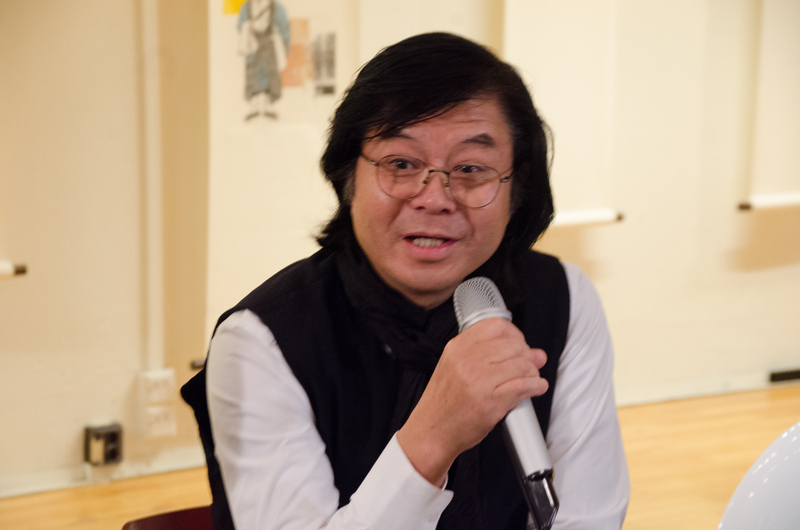 Li Chengxiu said that due to different cultural backgrounds of different countries, artistic exchanges are also difficult. However, it can be very beneficial to cultural exchanges and even the exchanges between countries. Through continuous exchanges, constant experience, continuous polishing, we can make fine arts by learning from each other. 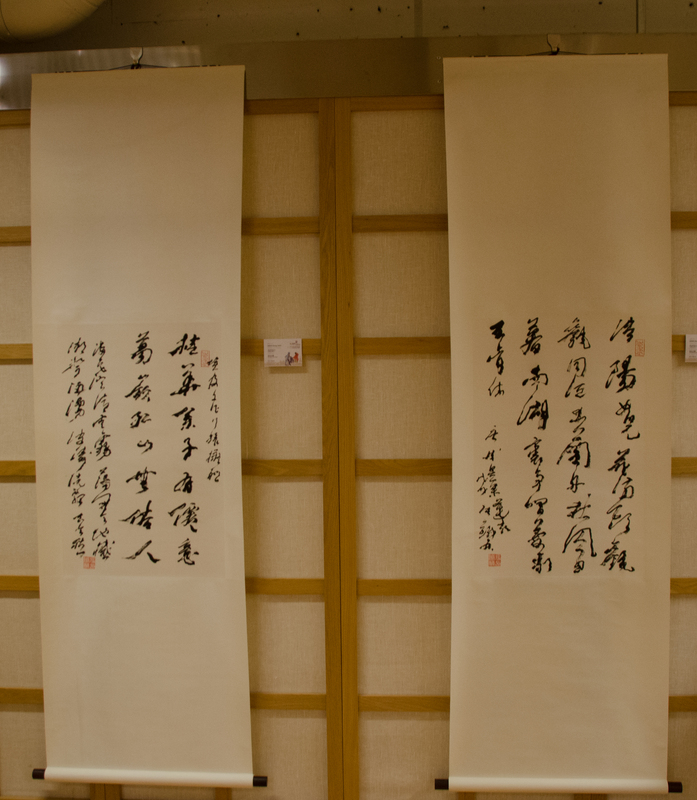 The film star Zhang Tielin exhibited his calligraphy. He said that calligraphy is actually an important foundation for all his roles and careers. Zhang Tielin said in an interview with reporters that Stockholm is a very mysterious city for him and he hopes to come again. “I have involved a lot of fields in the art industry. All my achievements if any are worthy of my calligraphy capability. To put it simply, I want to speak Chinese well, write Chinese characters well, and tell good Chinese stories.” said Zhang. “I didn’t think that it made me greater to have played an emperor, However, I felt I learned a lot by playing more emperors or talented people. It helps me to know more about history. Especially to play them, I have more personal experience of history. Then, when I use my own point of view to interpret and perform them, I was influenced by historical heritage. On the other hand, it can be said that everything I have done has actually been benefited from my calligraphy. I can hardly imagine that I can play so many characters without writing calligraphy. Different types of roles with such a large span.” said Zhang. It is understood that Zhang Tielin is actually not only good at playing, he was originally a film major, but he has always insisted on writing calligraphy, singing Beijing opera, and he sings very professionally. 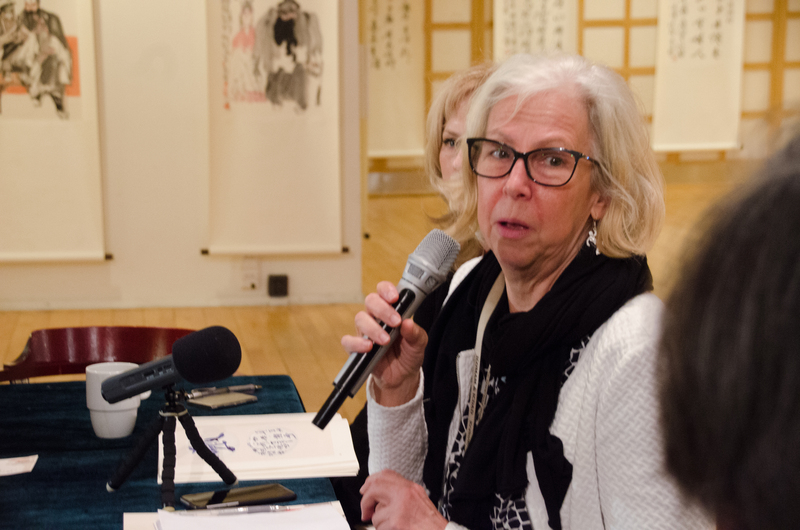 Before the opening ceremony, Chinese and Swedish artists held a seminar to introduce and showcase the blue-and-white porcelain from Jingdezhen with the Beijing opera and calligraphy elements, which is also an artistic innovation. Swedish Chinese Peking Opera artist Wu Jiangyan and calligraphy teacher Wan Juan, Ewa Rudling, Swedish photographer and writer, Anders Welander, Swedish senior specialist in art, print and works of Art, Maria Lindskog Krasznai , Stockholm University, Bachelor of Chinese Studies, Stockholm Master of Fine Arts Education at the Academy of Arts and Crafts and Xuefei Chen Axelsson, Editor-in-Chief of the Green Post, President of China-Europe Cultural Association, attended the seminar. 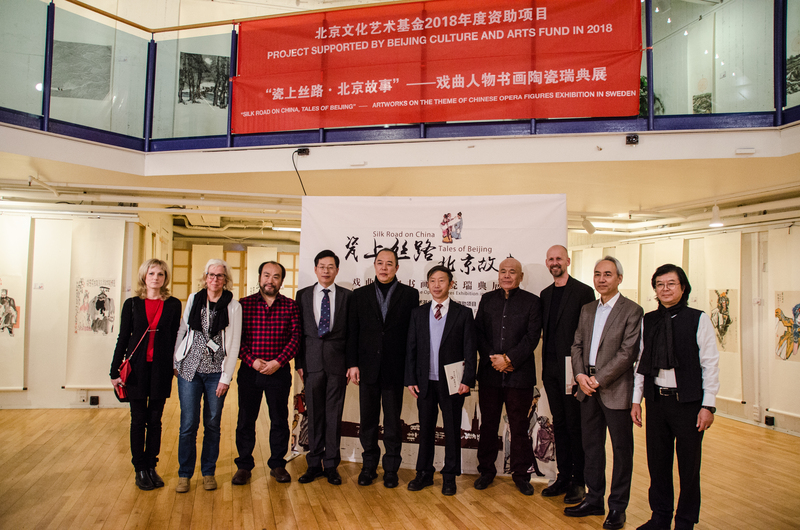 The two sides discussed the theme of the exhibition, the significance of the Belt and Road Initiative for cultural exchanges and the prospects for future artistic exchanges. 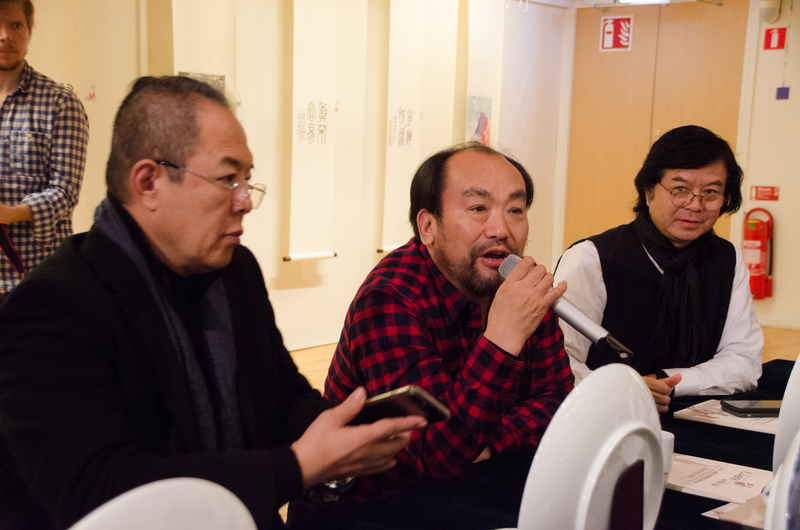 The artists also briefly introduced their respective experiences and successful experiences on their childhood. In general, successful people start from strong interest, and then constantly explore and pursue, diligently, tirelessly, conscientiously do what they want to do best. 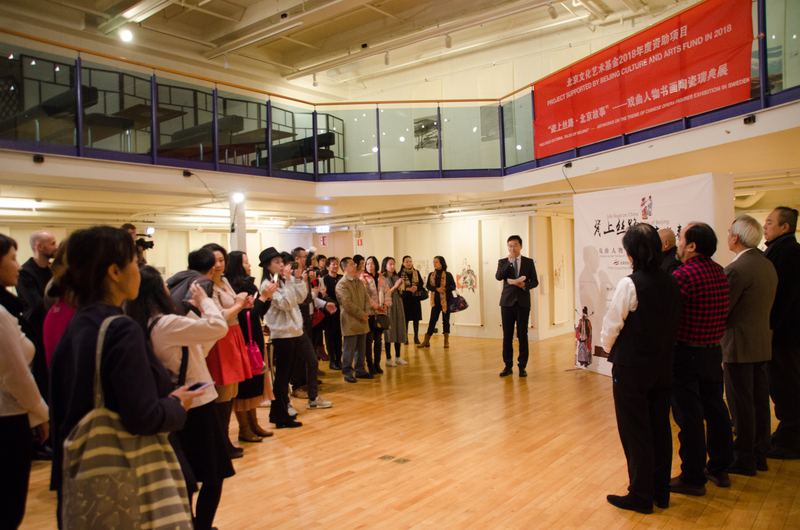 This exhibition has been warmly welcomed by many Chinese and overseas Chinese. They were very happy to have the opportunity to see the superstar painters and calligraphers. In such an autumn day in Stockholm, one can appreciate the wonderful masterpieces. The work makes people feel the warmth from the motherland China. The essence of Chinese culture brought by the artists is very welcomed. 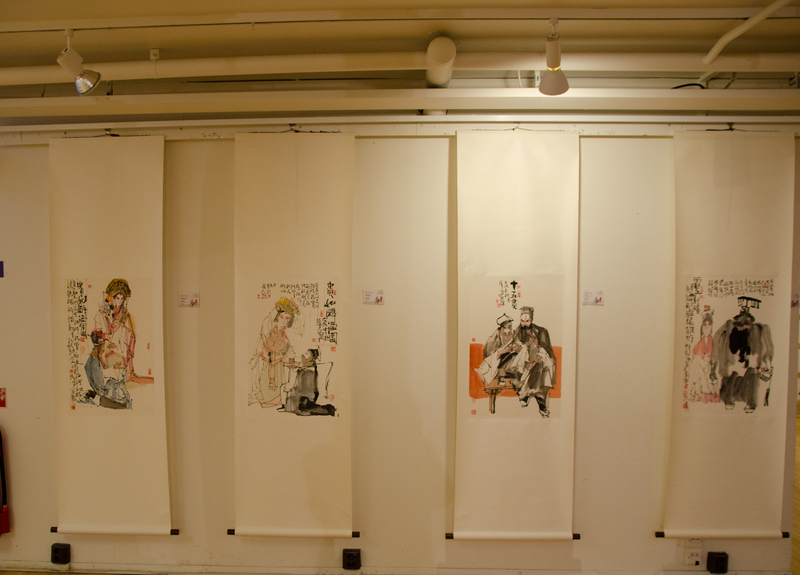 Zheng Shanlu’s works include elements such as “Male”, “Female”, “Young Man” and “White face”. 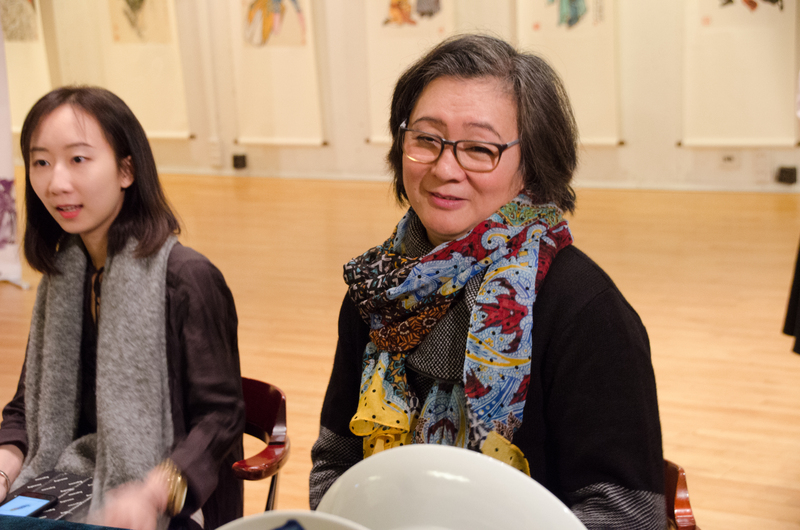 Lu Tianning’s works include “The Drunken Concubine”, ” Concubine Yu Ji Dance with Sword” and “Spring River”. In fact, he also has a lot of works about Tibet. The works of the artists are elegant and the style is warm and inviting; the picture is simple and succinct, and the style is unique; the title is unique and interesting; the simplicity and exquisiteness are displayed. From the works, we can see the artist’s great efforts in the innovation of traditional forms. I can see the artist’s peace of mind and the sincere attitude towards art. One can feel their respect for tradition, their respect for craftsmanship, and their cultural consciousness that is close to contemporary life. The guests attending the opening ceremony included Zhu Jinchuan, General Manager of Air China’s Stockholm Department, Wang Yuli, President of the Swedish Federation of Chinese Companies, Swedish Chinese soprano singer Zou Rongmei, Swedish Chinese Peking Opera Kunqu singer, Hao Jingxia, Swedish Chinese Soprano singer Li Jia, Zhu Yingying, president of the Swedish Chinese Artists Association and other Chinese and foreign artists and literary enthusiasts. © 2016 北欧中华网-Chineseonline.se. All Rights Reserved.